Alan Greenspan calls the job of being America's top central banker "torture." Current Federal Reserve chair Janet Yellen just raised interest rates for the first time in nearly a decade. By all accounts, the rate hike last week was smooth and successful. Yet Yellen doesn't get much of a victory lap. Already the questions are coming: what's next? Yellen put the chance of a U.S. recession next year at about 10%. But even beyond the "R-word," Yellen will have to deal with a number of problems. No one likes uncertainty. And right now, the Fed is serving up a lot of it by sending mixed signals. Last week, the central bank said the economy was doing pretty well and its forecasts implied four more interest rate hikes next year. But Yellen repeatedly stressed that the Fed would go slow because there are real risks to the economy and markets. She used the word "gradual" 13 times and "accommodative" (think low rates) seven times. The key to understanding where the U.S. economy and the Fed are going in 2016 is to think about what could go wrong. What are the shocks that keep the Fed up at night? By far the biggest stress for members of the Fed is that inflation is AWOL. "What scares them is inflation. It's been about inflation all year," says Ellen Zentner, chief U.S. economist at Morgan Stanley. She correctly predicted that the Fed wouldn't raise rates until this December. The Fed's target is 2% inflation. Its preferred inflation metric is running at 0.4%. For regular Americans, the absence of inflation isn't so bad. It means prices on everything from gas to housing to clothes aren't going up much. But economists on Wall Street and at the Fed believe that a healthy economy has at least some inflation. Think about inflation like your heartbeat going up when you exercise. It's a good sign you're working hard. Yellen continues to believe this ultra-low inflation is just a passing fad. But the Fed statement and Yellen's remarks last week stressed that the policy committee was "carefully" and "closely" watching to see if inflation picks up in 2016. "We have a significant shortfall on inflation, so we are calling attention to the importance of verifying that things evolve in line with our forecasts," said Yellen. Zentner takes that to mean she actually needs to see data showing an uptick before raising rates again. 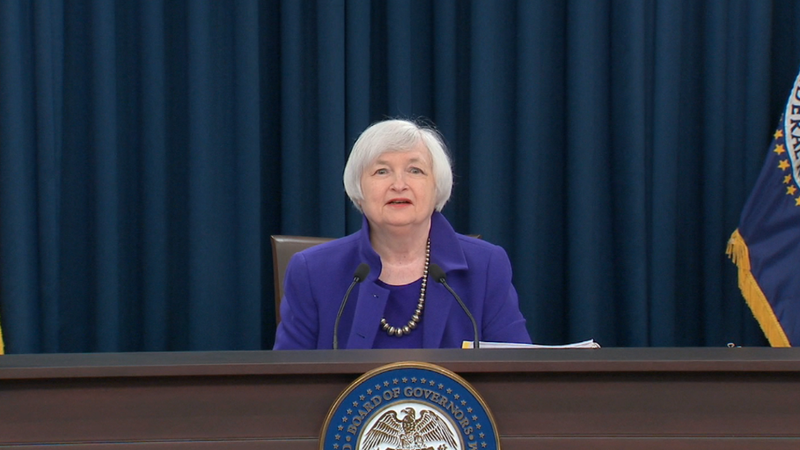 She thinks that isn't going to happen for awhile, so the Fed probably won't raise rates again until June -- and thus only do three, not four, rate hikes next year. "(Yellen's statement) really raises the bar on what it will take to raise [rates] further," says Zentner. The wild card for 2016 is China. The economic slowdown there has thrown a number of countries like Brazil and Canada into recession. It's hard to get a good read on what's going on in China because the government statistics are so unreliable. The Community Party says the worst is over after the Chinese stock market meltdown over the summer, but the government has a tendency to tinker and intervene. The exchange rate snafu in August caused such a severe negative reaction around the world that the Fed didn't raise interest rates in September, as had been widely expected. "The Fed is concerned about the stability of global markets. They are very dependent upon each other," says Tony Bedikian, managing director of global markets at Citizens Bank. The U.S. economy has held up well despite China's problems. Spending by American consumers and companies is the main driver of economy -- accounting for about 85% of economic activity. So China's influence is small, but it's there. The global economic headwinds from China and elsewhere have also helped keep inflation down in America. "If we continue to import a good deal of deflation from China, that spells uncertainty around the outlook for inflation," says Zentner of Morgan Stanley. 3. What will the market do? What's hardest for the Fed to manage in 2016 is the markets. The first rate hike in December was basically preceded by a big blinking sign that said "it's coming." That's why the reaction was small and went as expected. But already the Fed and Wall Street aren't in sync. The Fed is implying four rate hikes next year and most Wall Street economists predict only two or three. Big problems pop up when the Fed and the markets aren't on the same page. The Fed seems to want to avoid the mistakes of the 2004 rate tightening cycle where the Fed telegraphed it would raise rates 25 basis points at about every meeting. "It didn't have the tightening effect that it was supposed to. That led to too much overheating too quickly," says Zentner of Morgan Stanley. The Fed is doing everything it can to say that's NOT the plan this time. But, of course, that brings uncertainty. The stock market is on track for its worst year since the 2008 financial crisis. The S&P 500 is likely to end with a loss. If that downturn worsens in 2016, it will make it very hard for the Fed to justify more rate hikes. "We have been and will continue to track developments in financial markets very carefully," said Yellen.